The seeds of bicycle culture in Denmark were first sown 120 years ago. We found a fascinating article about some of the historical aspects of Danish bicycle infrastructure history and thought it relevant to include it here. 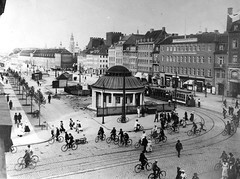 The first bike lane in Denmark was constructed on Esplanaden in 1892 and in 1896, Copenhageners were allowed to cycle on the side of equestrian paths. Marking out bike lanes in Copenhagen, 1915. Bike lanes along roads weren't, however, constructed back then, despite the rising number of cars on the streets and the rise of the bicycle as transport. There was a battle for space in the cities. Between bicycle users, trams and horses and carriages. It was in 1923 that bicycle users and pedestrians were first allowed to use the one metre wide shoulder on country roads. Nevertheless, many bicycle users chose to avoid the shoulder because of the refuse that collected there, choosing instead to ride farther towards the middle of the road where the coast was clearer and the surface smoother. Every year, members of the Danish Cyclists Federation collected many kilos worth of horseshoe nails and other sharp items from the roads surrounding Copenhagen. The loose, and sharp, stone chippings were also a pain. In 1918, the Danish Cyclists' Federation (DCF) complained to the regional authorities about these chippings but their concerns fell on deaf ears. 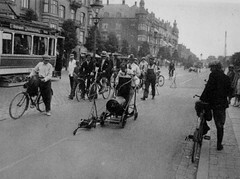 Then again in 1922 the DCF published their demands in 98 newspapers: "Denmark's Cyclists Demand Bike Lanes Along Roads!" There was a need for separated bicycle infrastructure, either with curbs or bollards, and it was time to demand them. "If there isn't a boundary between the car lanes and the bicycle lane, then the bicycle lane isn't worth much. We have sad experiences from the country roads outside of Copenhagen", said Max Tvermoes, Vice Chairman of the DCF in 1922. The seed was planted in the minds of traffic planners about the importance of bicycle infrastructure. 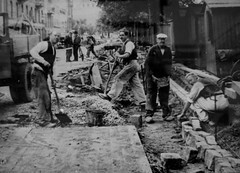 They had spent great amounts of money and energy in the first decades of the 20th century upgrading roads with better surfacing. The result was that cars became easier to steer and could travel faster, which made it more dangerous to ride bicycles. The time was ripe for catering to the vulnerable traffic users. On the islands of Funen and Bornholm there was talk of constructing bike lanes along the country roads in 1922/23 but they didn't materialise. In Copenhagen region a cycle track was built along Roskildevej to Glostrup. In 1926, the first experiences with building bicycle infrastructure appeared in print. The larger towns had implemented a lot of infrastructure, even though it was difficult finding space for cycle tracks in the narrow streets. City Engineer Rygner, from Odense, presented the many cycle tracks leading out of town in a published folder. The Technical Road Committee (Den Tekniske Vejkomite) published a guide in a traffic publication - Dansk Vejtidsskrift - about how traffic departments could design roads that matched the demands of modern traffic. This included, of course, bicycles. The Committee recommended two types of bicycle and pedestrian lanes. Either placing the lanes on filled in ditches alongside the roads or placing them on the far side of the ditches, creating a buffer between the bicycle users and the cars. 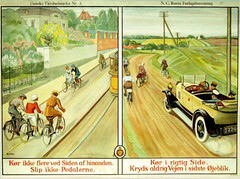 Royal Danish Automobile Club attempted to 'educate' cyclists with a school brochure from 1922. Bicycle users in the 1920s were 'irritating' to motorists. They often rode in rows and crossed the streets when it pleased them to do so. Using the streets like seven centuries of city citizens before them - just on two wheels. Traffic behaviour was a new phenomenon now that cars started multiplying. It was in 1924 that red reflectors were made mandatory on the back of bicycles but tackling the growing number of accidents involving cars was tricky. Giving each traffic user group a section of the streets was the way forward. In December 1928, Denmark's Cycle and Auto Industry Association and DCF tried to call attention to the problem of traffic accidents - contacting all the authorities they could, from the government to the local parish councils. Curb-separated cycle tracks, painted lanes or bicycle streets? By the mid 1920s the construction of bicycle infrastructure had become such a hot topic that it was discussed at the AGM of the Association of County Councils in July, 1929. Separating traffic was a compelling necessity, even though it cost money and demanded space, stated Vice-chairman Henningsen of the National Tax Council (Landsoverskatterådet) in his speech at the AGM. His main message was that cycle tracks should be of high quality, otherwise cyclists would just use the road. But which solution was best and least expensive? County Inspector Troelsen from Aalborg, in his speech about "bicycle stripes", said that on the country roads of Northern Jutland the bicycle users didn't mind cycling on the narrow painted lanes on the shoulder of the roads. The county road adminstration had therefore widened the asphalt on the sides of the road to allow for one metre on either side for bicycles. Aalborg town had built physically-separated cycle tracks along the roads leading to the town centre but they were little used. "Building physically-separated cycle tracks along our country roads is, in my opinion, the wrong approach". They were also more expensive to build. Holbæk County supported cycle tracks parallel to roads. 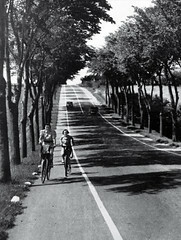 They also painted lanes to separate bicycle from cars like was popular in Germany at the time. They were a cheaper solution in case the roads needed widening, and many roads did back then because of increasing traffic. Bicycle roads were widespread in the Netherlands due to the densely-populated areas that were rare in rural Denmark. That country had a Bicycle Tax for financing a national network of cycle tracks. A Bicycle Tax was discussed in Denmark, too. Taxign bicycle rubber was a proposal to pay for cycle tracks, but it never ended up happening. County Road Inspector Ellert, from Holbæk, proposed in 1933 that the motorist tax should also be used to build cycle tracks because motorists also benefited from them. Denmark's first Traffic Law, in 1923, was revised in 1932. Using existing bicycle infrastructure was made mandatory. This was certainly relevant in cities and towns where there were many cycle tracks, but less so in the countryside. In 1930, there were only around 88 km of bicycle infrastructure along roads. In 1933 this had increased to 342 km but that was only 4% of all the country roads. Hardly adequate for what was then the world's most cycle-friendly nation with 44% of the population using bicycles each day - 1.5 million people. 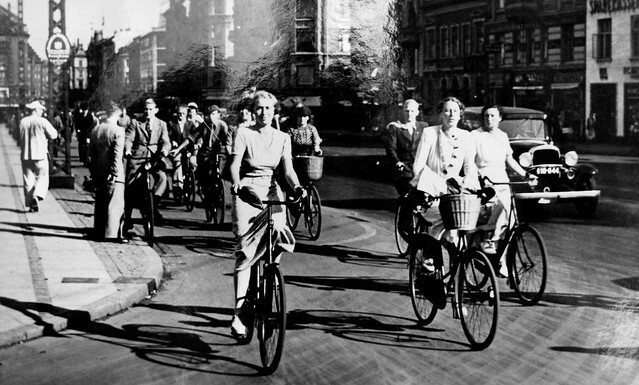 In the second half of the 1930s, safer bicycle infrastructure came into focus. The cheap solution of painting stripes on the edges of roads didn't protect the cyclists. The Netherlands shared this view. The head of the Town Planning Office in The Hague said, at the International Road Conference in 1938, that "The usual reserved stripes for cyclists, with only a line separating them from the road, can only be regarded as surrogates". Even though Danish traffic community wasn't crazy about the idea of building safe, physically-separated infracture because of the high price, they were positive about buffer zones between bicycles and cars. This could mean a "dead zone" comprised of trees planted in a wide grassy area or a ditch. In the 1930s, building bicycle infrastructure was the focus of many traffic studies that tried to determine how cycling conditions could be improved on the Danish country roads. Advantages and disadvantages about the various designs were studied. For example, should the infrastructure be on both sides of the roads or bi-directional on only one side. Traffic engineers investigated different types of surfacing that could be used on cycle tracks. Gravel, "bitukalk" (a mix of bitumen and chalk), cast asphalt and cement concrete. 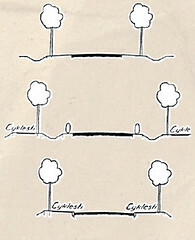 Proposals for Cycle Track Design, 1937. The need for bicycle infrastructure was also analysed. It was determined that cycle tracks were necessary if there were 100 bicycle users - or 100 motor vehicles - an hour on a stretch of road. Danish traffic planners did a flurry of measurements and counts to document when a hill was too steep. They did field work to study when bicycle users got off their bikes on hills and pushed them up and when they managed to cycle up. Traffic departments could read the results of these volumes of information and recommendations in publications issued by the splendidly named Danish Road Laboratory's Road Committee (Dansk Vejlaboratoriums Vejkomite). In 1938 the publication was called "Views on the Implementation of Bicycle Lanes, Bicycle Stripes and Pedestrian Paths" and in 1944, "Bicycle Lane Fixtures". Translated freely from the Danish from a brilliant article by Mette Schønberg - Head of Denmark's Vej og Bro Museum in Dansk Vejhistorisk Selskabs magazine Trafik & Veje, September 2009, pages 36-39.